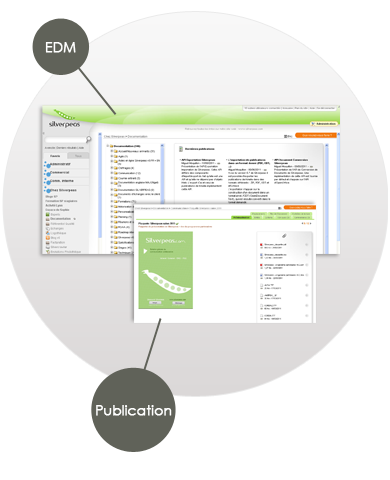 The silverpeasTM EDM allows content to be created from an XML form, where a metadata description of the publication is stored. The EDM is a complete WYSIWYG Open source editor, which allows text from MS Word to be copied and pasted without the loss of formatting. Files of any format (MS Office, Pdf etc) can be attached using drag and drop straight onto the web page. This is a simple way of publishing because silverpeasTM can exploit the file properties such as title or author. A more complex workflow with multiple steps and parallel or conditional connections, is of course possible. Publications can also be classified using the classification scheme. The EDM service is called "Theme tracker", organized by themes and sub-themes. All users with authoring rights on a Theme Tracker, can fill in forms, place files and download all types of files. Authors can create new publications in each theme with an unlimited number of levels. When a file is deposited, it will be automoatically indexed if it not readable by the search engine. The following file formats are supported by our search engine: MSOffice, Open Office, text, rtf and html. Template creation and modification of form templates is carried out by platform administrators and described in XML. An administration tool allows platform administrators to automatically manage new forms. The digitalizing system outputs an XML file which is imported into Silverpeas by the same import engine used for the retrieval of basic information. Most silverpeasTM services allow information to be pushed. It can be used to notify all or a section of the users of a service. The notification engine allows all users to choose a channel through which the alerts will arrive. By default, notifications are sent via email, but there is also an internal notification box at silverpeas. In the case of a workflow engine, the status can be defined by the workflow creator. The workflow engine allow alerts to be sent if a time-out is reached at any stage. It is also possible to change status. Publications have a visibility start and end date. By default, the visibility start date is the date of creation of the publication. By defalut, there is no defined end date. Form settings can be set by the platform administrator via an on-line tool. The fields available are: text, text zone, rich text, check boxes, radio buttons, drop-down lists, date, user, url, image and file. When a form is defined, it is possible to make the fields required. The design of the form can also be modified using html styles. SilverpeasTM allows multiple language use for its forms. The choice of form to be associated with a publication can be restricted, according to the place where the information is placed. Silverpeas allows a classification scheme to be common to the whole platform. However; its use can be limited according to the space or service used. The classification tree structure is visible in the navigation part of the application or accessible via the search engine. The classification scheme is exported in XML format by default. The SilverpeasTM search engine uses the Lucene Open Source component from the Apache Jakarta project. The search function is accessible from the home page and is always available whilst the Silverpeas platform is being used. The search engine also includes a function which recalls the results of the last search. The basic search is used to search using a character chain, on the entire contents of the platform data (metadata and attached files). The advanced search can be limited to a collaborative space, a service, an author, to publication dates or the axes of the classification scheme. These functions are available on the full-text search, as well as for the search fields on a form. The platform can save a request submitted to the search engine. Searches can be launched again later with a simple click. The list of saved requests is accessible from the personal space or advanced search interface. Only the last search result is saved.